We wanted to send over a huge THANK YOU for all your help in the organising of this trip. The press had the most amazing time and a lot of that was down to your support with all the planning. Thank you for being so patient with us, I know we have been a nightmare at times but we really appreciate it all. As promised we will share your details round the office in case anyone else is planning something similar to be considered. The event was so much more than a long walk. Tough at times but togetherness kept everyone going. A hugely well-planned event that resulted in a fantastic amount raised (about 45k) and generously topped up to 50k by Steve Parish. It was a great experience, that I’m so proud to have been a part of. Tough going though! Amazing experience. Great camaraderie. Everyone so friendly and a great chance to represent your club and help the Palace for Life Foundation help young people in our community. Makes us proud to be Eagles! Great camaraderie of Palace fans getting each other through the challenge and seeing Palace legends and the Chairman out for the walk, too. It was a very well organised, route was very good and clearly made aware of the route. The service at the stop offs where excellent. Marshalls were brilliant. Thanks for an amazing trip, thoroughly enjoyed it! Most enjoyable ride experience I have ever had. Adventure Café did a great job of organising and running this amazing ride. I personally have really pushed myself to prepare and complete this ride, and have felt very well supported by Adventure Café. I’d strongly recommend them to anyone, and am looking forward to future trips organised by them. Thank you for all your support. This weekend for the group was fantastic and everyone massively enjoyed it. We have raised nearly £2500 so buzzing about that also. I’ve received great feedback about Rob the ML so please send our thanks etc his way!! Thanks so much to you and the team for overseeing and running the event yet again, so well. the fundraising (with matching) is now over £16,150 so an amazing amount for a relatively small group of people which you were definitely a part of. I just wanted to ping you a note off the back of what has been a fantastically successful first LSEG Cycle Challenge. Hopefully the first of many. Tom and Andy are both a credit to your company and really made the trip a seamless and very well organised experience. To be able to marshal a group of such varied ability and experience on the bike, through such a demanding itinerary and everyone come out with a beaming grin is nothing short of heroic! Everyone that took part is unanimous in their praise of both of them. Thank you so much to Adventure Café for keeping us safe and helping complete our pedal and paddle marathon! The dream time just completed 25km cycle and an 18km kayak! All the money raised for the Wisdom Hospice! We rode from London to Paris and it was an incredible amount of fun- they picked a lovely route, provided tasty lunches and dinners, and made sure we made it! Not having to worry about bags or bikes or transport made the whole trip so much more enjoyable, and it's a trip i'll remember fondly forever. Amazing weekend. Great group and very well organised. It was an absolute blast! So many giggles and wonderful memories. Awesome route and very well organised. Just trekked up Mount Olympus and cannot thank the Adventure Cafe team enough for all their organising and support. Fantastic and will be highly recommending them. We did the Adventure Cafe Mega Abseil event in Weston-Super-Mare and had a great time! The event was well organised and the instructors were really friendly and helpful. I would definitely recommend it! Just back from another trip, so many thanks for this, and for organising such an excellent tour of the Douro Valley. All seemed to run like clockwork! A great trip, and now that I know how to get up hills, there will be no stopping me. Many thanks indeed and looking forward to the next one. Thank you for organising something that will leave a lot of memories in their minds, thank you for the enthusiasm of Dave and Tom. It was a great ramble through the country and just about managed to stay upright in the mud, we had such a laugh. So many great memories and would definitely recommend you to set up something in future. So thank you, for the experience, for the memories, for the laughs. Thanks again for all the organisation on Saturday, honestly it was so smoothly done it almost was very un-Palace haha! So pleased with the total raised too. Just wanted to say a massive thank you to you and the team for everything you did on Saturday and in the weeks beforehand to make our Cotswolds challenge happen! We really appreciate you rolling with the punches and making sure everything went ahead and went well! Everyone had a great day and are really grateful to you for delivering a fantastic event. We’d like to get next year’s event confirmed before Christmas! I will say though that AC did an incredible Job today and you made the day a fantastic success. Everyone who was on the ride has nothing but positive words to say. I just wanted to say thanks to you and the Adventure cafe team for organising a great Three Peaks Challenge for Allianz and Hammersmith & Fulham Mind. It was brilliant and I only heard positive feedback from the team. The guides were very professional, patient and competent. I was in the (much) slower group so Martin was with us and had the task of waiting for us/encouraging us up all 3 peaks, and he was a great guide and made the trip even better. Thanks again and if we do something similar in the future we will definitely use you again. Just completed your three peak challenge organised through Mind. 46 people, all mixed abilities and you guys got it perfect. Absolutely loved the experience. David the Team manager was great. Rob our group leader was sound. Loved it and would happily recommend you. Thank you! It was an amazing experience, such a sense of pride! I'd really appreciate if you could pass my thanks onto the guides who supported us, particularly Alistair and Dave who were amazing! Thanks for all your support. We have had an incredible 2 days! On behalf of everyone who contributed, donated, supported, helped and cycled – sincere thanks to you all – it was an event that will live with us (and I’m sure each of you) for the rest of our lives. A very big thanks to all of you for organising our charity abseil this weekend. It was a fab sunny morning spent in a lovely location…I couldn’t think of a better setting or group of people to abseil off a quarry with! Thank you to Dave and Richard for their expert, friendly guidance. I just wanted to follow up on conversations over the past couple of days and thank both the leaders for all they did while we were in Italy. The trip was great and I thoroughly enjoyed it. Thank you. You’ll be seeing me again! Just wanted to let you know I have had MANY emails this morning telling me how fantastic yesterday was, and how wonderfully organised and supported. Please do pass on this message of thanks to the rest of the team, and I will see you in a couple of weeks! I’d just like to say a MASSIVE thank you to you both for all of your support to Oliver Wyman during the Three Peaks and London 2 Paris challenge. Everyone had a great time and praised the Adventure Café teams for your support. So just to reiterate - thank you to you both and all of the Adventure Café team for making this so successful! Dear Adventure Café team - Many thanks for putting together a terrific cycling event for us this past weekend. I thought it all worked out incredibly well, with slick organisation from start to finish - quite an achievement when herding 150 riders of varying ability over 260kms. So far as I know, everyone made it without any major incidents. I was also impressed with your ability to arrange perfect weather in France, even though it was apparently quite grim in the UK on Saturday! Adventure Café Team - Many thanks for putting together a terrific cycling event for us this past weekend. I thought it all worked out incredibly well, with slick organisation from start to finish - quite an achievement when herding 150 riders of varying ability over 260kms. It was an absolutely amazing experience, climbing three fantastic locations surrounding by a lovely group of people. I couldn't have asked for more! I was very nervous about doing the 3 peaks within 24 hours but the team were fantastic and everyone displayed positive energy (even at 3am). I can honestly say I will be doing more trekking after this, I thoroughly enjoyed the experience and look forward to doing another challenge with Adventure Café. Just a quick thanks for an amazing cycling trip. Paul and I had a great time, we really felt that the organisation and running of the event was escellent. Wanted to pop you and thank you for the stellar few days. You and your team did a phenomenal job and I’m glad we went with you. I know I’ve come back and given a glowing review of you to the decision makers here when it comes to next year’s ride. Thanks again. Not only did our leader keep as all safe, but was brilliant in getting the transfers sorted out and keeping me informed all the way. I will be recommending to Mark that we use Adventure Café again next year. Having completed the Way of the Roses event last weekend by supporting amputee friends in Limb Power, please pass on a huge thank you to Alan, Neil and Olly. The success of the event must be attributed to all three of them whose attention to detail throughout the whole trip was constant, they worked completely as a team and knew when to offer encouragement and support with-out being overbearing or patronising. A huge thank you to you and your team for a fabulously supported event. I hope you had some time to chill out in Mallorca yesterday! Look forward to meeting up in August to kick start 2017! I have just participated in the Jeff Stelling Marathon walk, day 10 and I just had to take the time to email you and let you know just how brilliant your company was in managing the walk. I run long distance races and am used to good marshalling but honestly your guys were amazing. It’s no easy task stopping London traffic at the best of times never mind stopping it to allow some 100 people to cross but your guys somehow managed it brilliantly. You guys did a truly awesome job today getting us all safely around, and what top guys you were too, thanks so much. Just wanted to pass on our warmest thanks for one of the most incredible trips we’ve ever made. I think the experience was what it was due to the time you invested with us prior to the event plus the daily evening research you did for us. Additionally adapting the plan where required to accommodate our mixed ability group. It was nice to have the reassurance that we had a strong and competent support team throughout the adventure. Grant Thornton have worked with Adventure Cafe for the past decade when engaging in high ‘octane’ fundraising events; such as the Three Peaks climbs and more recently an abseil off the Grant Thornton Euston building. We have a long association with the Adventure Cafe team who are brilliant at providing expert guidance and, importantly, safety and risk analysis for these activities. 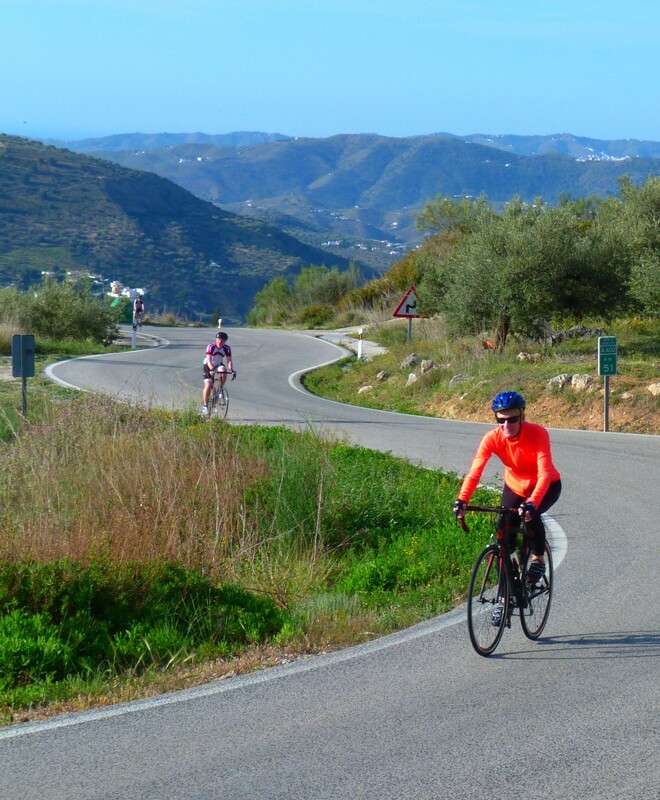 Over the years I have ridden on a number of organised cycling tours and this one certainly comes out top of the pile as echoed by the various emails received from the group. Whilst I had little interface with your other folk who were working away in the background, I think I can safely say on behalf of the group that our thanks should also be passed on to them as unsung heroes. A good, all round top team indeed. I would like to say a massive thank you to all at Adventure Café for making the London to Paris cycle absolutely fantastic, the support from start to finish was excellent. As part of the open group on the trip on the 23rd July 2014, I’m sure I speak for all of us when I say the trip was thoroughly enjoyed by one and all. Well done guys, you do a brilliant job. Martin, our team leader was particularly excellent at being able to give everyone a bit of what they needed, to not only get everyone there but to allow all abilities to work together as one team. Whether fast or slower, everyone appeared to not only meet their expectations but to go beyond. A big thank you to Adventure Cafe for the professional set up and effort to lead the 45 cyclists from Prague to Belgrade and helping ALIVE Charity Foundation make their annual fund - raising cycling challenge for Cancer a spectacular success. I did the London to Paris ride in July 2014. Richard and the Adventure Cafe guys made it a great experience. A huge thank you to you, Sarah-Jane and Alex for a great day today! Will and I really enjoyed ourselves and you all made it relaxed and fun – looking for our next challenge already! I am just writing on behalf of all of the girls on our 'Dartmoor Divas' team to thank Adventure Cafe for organising a great event for us. It went very smoothly, we had great weather and a wonderful time. A special thank-you for giving us Rob as a guide... I think we aged the poor chap by several years but he remained calm, stoic and determined to allow us to enjoy our adventure our way whilst keeping us safe. He is a lovely guy and we all enjoyed having him on the team. Thanks once again for an enjoyable challenge last weekend. I don’t think I would have completed the event without the encouragement of Damon and with him practically pulling me up the final peak. Knowing how tough these challenges can be will certainly help when I am trying to persuade our supporters to take part and also to stress how important it is to be prepared. I thought the event was very well organized and have already spoken to our events fundraiser about adding more of these type of events to our calendar. Thank you for such a fantastic weekend, I don't think I have ever enjoyed myself so much. It was lovely see you all, can't wait to see you all again at the next Khipu bash. Thankyou Adventure Cafe! Just wanted to say what a brilliant job you did this weekend - all the squelchy participants were singing your praises! So, many thanks for making it such a success against all the odds! Brilliant! I’m missing it! Can we do Morocco next? I'd like to say a big thank you for the professional manner in which the trip was organised and run. In addition to the pre planning and preparation you provided I would like to extend a huge thanks to the 3 cycle leaders who showed great patience and support for all the riders - all three were flexible in meeting our needs and ensuring our whole trip, including the evenings, were enjoyed. Just to say thanks so much for the last 4 / 5 days. We all described the trip as “Epic”. Had a fantastic time – great roads, great company, great leadership. And if I’m honest, your map reading was pretty good too! As usual it was a pleasure to take part in an adventure café event, which was well organised, professional, and provided an opportunity to bring together a group of like minded individuals who enjoy a challenge. Having the support car there with spares, and staff on board with technical expertise only enhanced the view of your company where all of the challengers safety is paramount with every event held. Also having these professionals alongside on bikes offering support and motivation made a huge difference, in some cases the difference between completing the challenge and not!!! Top weekend fellas great company and a job well done. Just a short note to say thank you for the Tuscany bike ride challenge that you setup and ran for Rainbow Trust. The event was great fun, well run, well managed and definitely worth repeating. What made it especially good was your attitude and professionalism. Thank you. Just wanted to say thanks to the Adventure Cafe team for organising such a great Welsh 3000s weekend. I think everyone on the trip had an amazing time. Iain was an amazing guide and it was really nice of him to not only keep us all safe and on the right track, but also teach us about the area and how to improve our walking/scrambling/climbing. I have just been on a 3 peak weekend with your company and would like to say that the whole event was fab from start to finish. Very well organised with great guides. A special big thanks to Nick(our super duper mountain guide) who jogged the final part of Snowdon with me and even carried my pack and sticks on the final 600m to enable me to reach my goal and fullfil a dream. Thanks again. Just wanted to thank Iain and Shaun for all their hard work, constant support and professionalism whilst I struggled to complete the Three Peaks Challenge this weekend for St.Clare Hospice. I am so grateful that I was able to complete the challenge and would like to thank both of them. Their management of the group was excellent and they definitely chose the right people for each of the groups. It was a great experience which I will not be repeating but am so glad I did!! We did the "English 3000's" for Meningitis Trust at the weekend. Just wanted to say a thank you to your guys that ran the event. All top drawer. A special thanks to Stephen-an inspirational leader. I'd just like to thank all of you involved in arranging our very successful Three Peaks Challenge trip last weekend. It was really fantastic to make it under 24 hours..thank you so much to Richard for getting us up all 3 peaks with such patience and good humour..I would not have made it without his encouragement!! It was very hard but it was an awesome experience and Adventure Cafe made it so. I will definitely be back for another challenge in the future! The weekend was a great success - thank you all very much. Steve the guide was great and once the pain goes away I'm sure we will all look back with a smile not a grimace! Many thanks for helping make this challenge a truly unforgettable and amazing experience and I am sure I will be contacting you in the future for my next challenge! Never thought I would sit here and admit to miss the pains and aches from our Picos Mountain trip! But I really do! PS. What will be our next adventure??!! Thanks for a great 3 Peaks Challenge! Really well organized! I had a wonderful time. Andy was a great guide for our team. I just wanted to say a big thank you on behalf of the Waitrose Tuscan 3 peaks team as we had an absolutely brilliant time. I would definitely recommend this trip to anyone. I was actually sad when it came to an end. Just to say thanks for last wknd, the whole thing was very good, well organised and enjoyable in a perverse way. Just a quick note to thank you for giving us such a memorable and fantastic week! You gave us all an unforgettable week! A Big thankyou - I Can say no more! I would like to say a really big thank you to both Richard and Boris for taking (putting up with) us and that I had a fantastic time, coupled with great company, a beautiful setting and copious amounts of Vino!!! As you know we went on the 3 peaks 24 hour challenge last weekend, although we never quite made the time all 5 of us completed the 3 peaks even though one or two at the end were walking like extras out of Michael Jackson’s Thriller!! A short thank you for making our sore bum trip to Paris such fun. Ten 10/10 for your organisation and map reading. I have just come back from the London to Paris cycle ride. I really enjoyed the trip and found the group varied and interesting. I thought the route chosen was superb as it maximised the time in the country side. I thought Dave and Steve did a superb job in making the trip and fun and convenient as possible. I would definitely chose Adventure Cafe again and will be recommending it where I can. Thank you Adventure Café for a terrific weekend and wonderful experience we could not have enjoyed it more! Everyone was buzzing about it on Monday morning. We are so grateful for all of your efforts and organization, and for actively and effortlessly joining in and encouraging all the bawdy mischief that so characterizes our approach to everything we do it really made the weekend such good fun. We would love to do something as a group and will nobble the boss as soon as he’s back from down under. Thanks you so much for taking me to Chamonix with Lily and Sarah. I had such a great time and was such a good experience... Thanks a lot..
We had a great trip, angst and all - we have come back full of scary moments and plenty of memories, and lots of laughs so thank you for that! I hope you have a relaxing weekend before you set off again into the unknown! Having spent most of August on our four centre holiday in Tanzania, we felt the need to express our thanks for your excellent organisation of the trip. Everything went like clockwork, from our being met by representatives of the company at Kilimanjaro International and also Zanzibar Airport, to enjoying great accommodation of a very high standard at all the resorts. All in all a most excellent and well organised trip. Just wanted to say thanks to Adventure Cafe for their fantastic organisation of the 3 peaks challenge. The guide, Iain Milligan was very supportive and informative throughout and I would like to extend my thanks to him as well. I just wanted to send you a quick email to say thank you very much for an absolutely awe inspiring weekend. We had such a great time and I think that was down to the expertise of the guides with us. It was a fantastic experience and something I would definitely love to do again. Thanks for a wicked time on the 'Road to Morocco'. Yet again, another great Adventure-Café production! Me n Ruthy are feeling a tad tired and aching a little, but it’s all worth it for the fantastic insight to life in north Africa, and the feeling of “achieving something completely stupid! Thanks for a Great Weekend.... What a good bunch of people they were to travel with...and what luck with the weather. In fact, I cant recall a single thing wasn't perfect on the whole trip. Fantastic! Half way across Dartmoor up to my waist in watery bog, after a 5:30 start, or another day at the 'office'? Give me Dartmoor every time! Climbing Kilimanjaro with Adventure Cafe was one of the most exciting, challenging and rewarding trips I have ever been on. Living amongst the locals showed us a fascinating insight into their culture, the mountain and how life revolves around the highest freestanding mountain in the world. I will remember celebrating on the top with a group of friends I had only met just over a week ago for the rest of my life! Just a quick email to say thanks to Richard and the other leaders, Paul, Dave and Derek; that practically all of us made it within the 24 hours. Can you please pass on my thanks to them, and I know that everybody was full of praise for their efforts and enthusiasm. We are already planning our next Challenge!